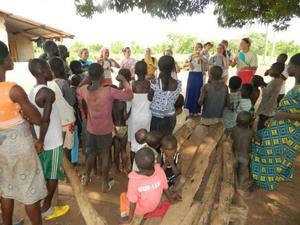 We are continuing the ministry here in Ghana trying to be the hands and feet of our Lord and Savior Jesus Christ. We are so excited right now of how God is working around and through us here. Last week we were at the Jirandogo Center and had a great time of ministry. We have 36 leaders signed up for the 2 year Church Leaders Training Academy. Classes will begin August 19 and it is geared for the Church Leaders who have had very little schooling. Most can read Konkomba but they do not speak English so everything will be translated for them. English will be one of their subjects but the focus will be learning more about the Bible. We had more than 170 women attend the ladies Bible Study again. They were taught English, were taught a Bible Lesson and given small first aid kits that Sherri and Kip had left. They were very appreciative. Randy and Suzy continue to go into villages and spend the day just loving on the people and telling them about Jesus. Suzy and Portia are spending a LOT of time with children and still getting some time with the ladies. Randy talks to whatever number of men that will talk with him, sharing Christ and answering questions people have. They are seeing salvations and being able to pray with people. I really don’t know if it is Randy and Suzy or the people that are enjoying the most. They do a great job. We appreciate you, our partners, please keep praying and giving. You are making a difference. John 6:35 Then Jesus declared, “I am the bread of life. He who comes to me will never go hungry, and he who believes in me will never be thirsty. Thank you for the pictures and updates. Prayers to you both always!!! Keep up the great work that you both do in the name of our Almighty, Wonderful Savior and know your friends back here are lifting you up!! The bread "factory" sounds like a piece of heaven!! =) Love to you.. Looking good!!! No more stopping by Nyankpala for bread. 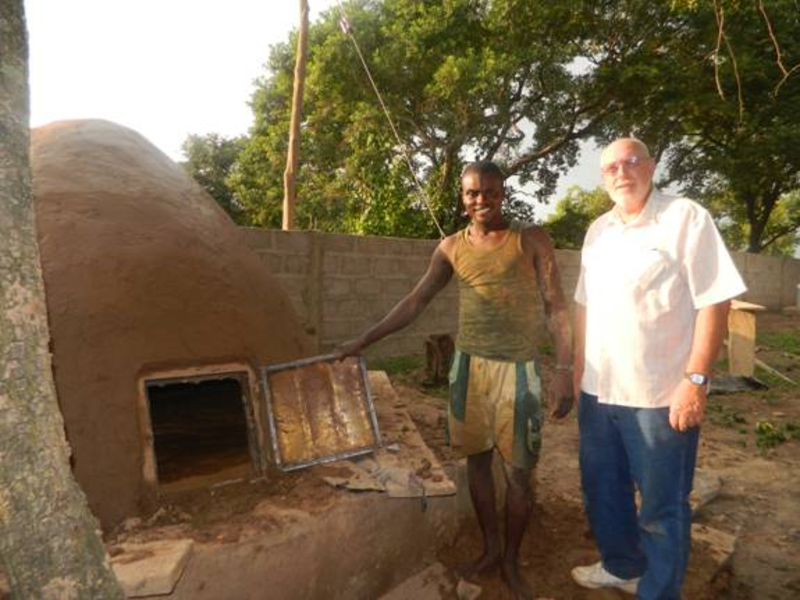 I had actually thought about Seed Ministry owning its own bread oven considering the amount of bread we consume, hahaha!!! Keep up the good works, may the Lord continues to burden the hearts of His saints for the great works of the Lord, through the Lord, and for the Lord in Ghana. Please tell Suzy hello for me & let her know I continue to keep her & Randy in my prayers. You guys keep up the great work you are doing! Is it Sadic who built the bread oven? Sure looks like him. What a great time we have had with part of the 2013 C.A.L. Graduating Class. 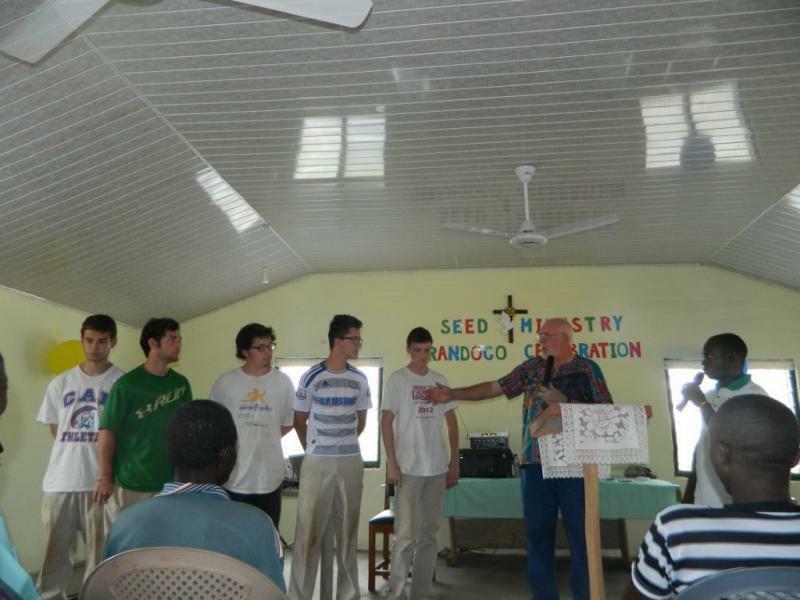 They were able with their Project 2013 to come to Ghana and be part of our Ministry Center Dedication. They ministered to 400 children at a time wow what a great group. These guys all are getting ready to go off to colleges to further their Education. We thank them and praise God for their maturity in the Lord. They were great and a real blessing to a lot of Ghanaians and they gave me more hope that God will use many young Christian men and women to help turn America back to a Nation under God. Our generation has not done all that well; we seem to always be on the defense instead of the offense. We also had a great couple that ministered with us from Hunsinger Lane Baptist Church, Kip and Sherri Selby. We enjoyed them so much as they shared, taught, dressed wounds, constructed bridges, painted buildings, and gave away Bibles and Benches. The list goes on. Whatever was needed they did. Thank you all and bless the fruits of your labor. I am so excited to know that this has been a great summer...watching the young adults share the Good News of Jesus. Please tell Suzy and Randy that I am praying for them. Love you guys!!!!!! 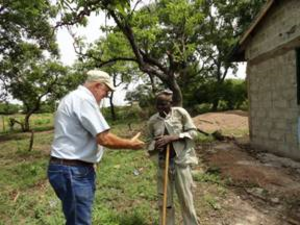 It is such a blessing to read about the work God is using you to accomplish there in Ghana. We miss and love you. Sarah, Sara and Megan that were here for the month of June as Mission Interns have gone home and the CAL team has come and gone as well. What an impact they had on the schools and Bible Clubs. They were ready for about anything and they did excellent on all the traveling in a crowded bus and horrible roads. 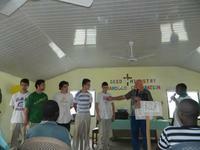 They did a great job ministering in so many villages. The leaders had them well prepared to be the hands and feet of Jesus. 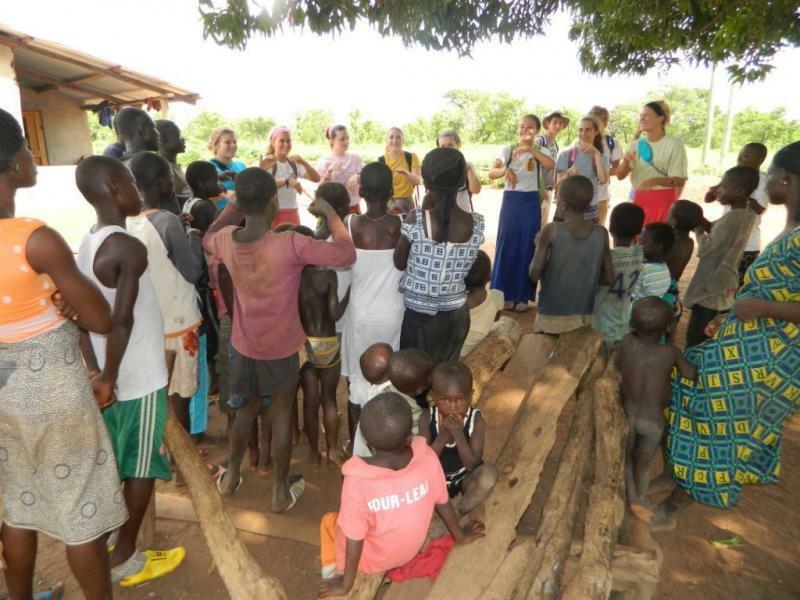 They were always ready with an amazing Bible story and they saw a LOT of children. There were many children who accepted Jesus as their personal Savior and many learned more about Him. We are so thankful they came. I am so encouraged that this is the new remnant that God is raising up for His Kingdom. Parents you can be proud, God was glorified through these teams. I have been making some new, old friends at the Jirandogo site. This old farmer came over to greet and sit in the shade for a while. It was good to hear him share things in his culture and family. Ministry is all about building relationships no matter which side of the world you live on. I heard a loud noise Wednesday afternoon; it was a cow which had gotten loose and making a lot of noise. People were chasing it and it ran into my fence and got knocked down. The men that were chasing it tried to get it up to make it move but it just laid there. They beat it then tugged and pulled on it to no avail - it would not move. Then one of the men pointed to a man coming and said, “Here he comes, he will know what to do. This old fellow came and started twisting the tail and twisting the tail tighter and tighter. Well it made the cow very uncomfortable, but it would still not get up. I busted out laughing and had to walk away . Emmanuel was gone to a village and I could not wait to tell him this funny story that happened while he was gone. Have to say, in my 5 months there, I never saw anyone biting a cows tail...but it would have made such a nice entry in the blog...right after Hannah killed the rat or John beat the snake to death, haha! Never a dull moment in Ghana, praise God!! We'll put that on John's bucket list when he's over there in October! I pray you will never have to bite a cows tail! What a great story! The only thing I can possibly think of left to see is Bob biting the tail of a stubborn cow!! Dont you do it,Bob! Thanks so much for sharing.This just draws us closer to you and momma Bonnie as you daily serve our Lord at Seed Ministry.Debbie and I love you and all involved in Seed Ministry.